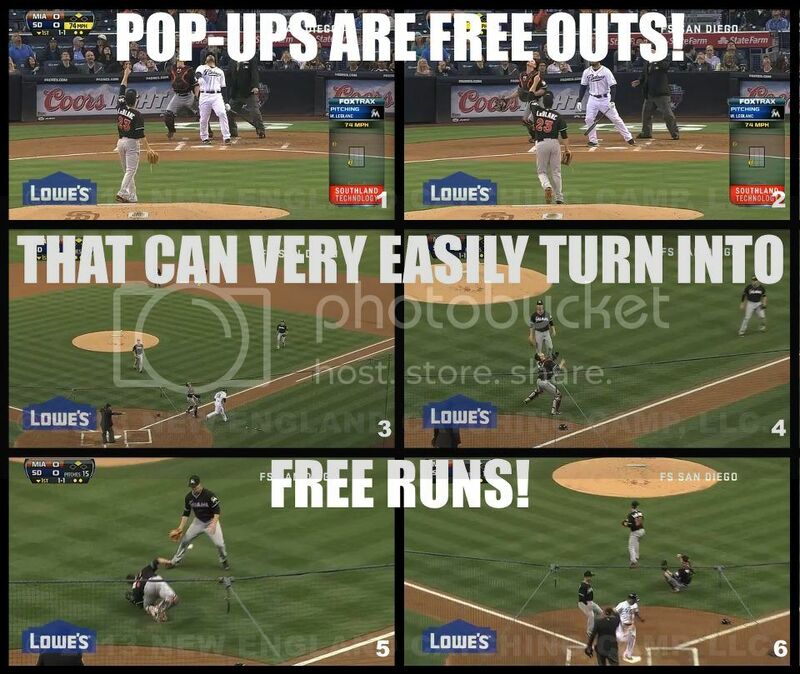 Pop-ups are one of the most given away "FREE" outs in the game. Catchers, it is important to remember that our first move on a pop-up should be to immediately get out in front of home-plate, turning our back to the infield. By turning we give ourselves adjustability during the play and a better view of the path that the ball is taking. If we don't get turned properly, it will become very difficult to read and react to the back-spin of the ball as it comes back down, usually tailing back towards infield. Rob Brantly of the Miami Marlins made that mistake two nights ago....and instead of getting out of the inning unscathed, the mistake led to a run. Ladies, I haven't forgotten about you.....your first move will very often be a drop step in the direction of the ball, but still turning your back to the infield, as there are significantly more "dink and dunk" foul balls over the catcher's shoulders in softball than in baseball. On the pop-ups that actually go up, the key is being to be able to set ourselves up underneath a spot two full feet in front of where we believe the ball would land. There will be less back-spin on the ball in the softball world, but wind and other factors can still affect the path that the ball takes to the ground. So it's good to maintain our ability to adjust in the middle of the play.